Welcome to Yala National Park, the most visited and second largest national park in Sri Lanka. Enjoy this safari holiday with Sri Lanka Travel Partner where you will get the chance to traverse this vast national park packed with abundant wildlife and spectacular scenery. Get ready to be thrilled by the authentic safari experience that will surely become an unforgettable memory. You will be accommodated at Yala Safari Camping. Meet with Sri Lanka Travel Partner's crew at 12:00 at Yala Junction and be driven into Yala Safari Camping. 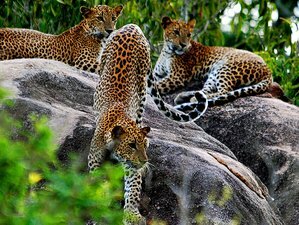 Yala National Park or Ruhuna National park, the second largest but most famous national park in Sri Lanka, is located 300 kilometers or so from Colombo and as most diehard wildlife enthusiast will tell you it is the best place to spot Asian elephants and leopards in Sri Lanka. Over 100 species of birds and 32 species of mammals have been recorded here and is considered a large bio-diversity hotspot. Yala National Park paths run through a spectrum of terrains from dense to scrub jungle, open savannah-type to semi-arid areas, rock pools, ravines, and freshwater lakes strewn with more than one prominent rocky outcrops, a snaking coastline where the wildlife behaves in an unconcerned and truly wild way and has ceased to take alarm and flee at the sight of humans but by no means docile, with over one hundred and fifty square miles of territory, traversing in Yala without a wildlife department guide is prohibited. The Asian elephant, leopard, black-bear along with crocodiles are the most common sights while peacocks, hornbills, and the gray languor monkeys keep you company along the route with their ceaseless cries, the buffalo, another unsung denizen of Yala can be unpredictable, easily riled and extremely dangerous with their sharp horns, are quite common in Yala. Yala east or better known as Kumana is a bird watcher paradise with rarities like Ceylon shamas, paradise flycatchers, red-faced malkoha, great thick-knee, and not so rare peacocks adorning the paths during dawn and dusk. Sri Lanka Travel Partner is a tour company that provides different kinds of safari, adventure tours, and seaside holidays in Sri Lanka.